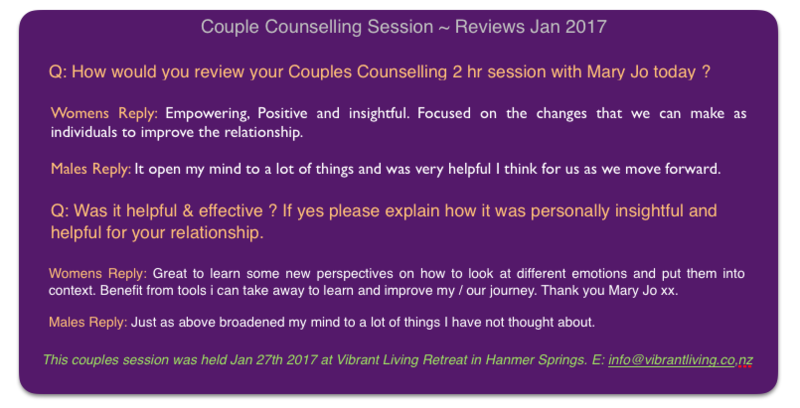 Book in with Mary Jo for a 2 hour Couples Counselling Session and discover new levels of insights, revelations, communication, healing, forgiveness, resolution, clarity, self empowerment and leave with transformational relationship tools moving forward individually and together to create the life and relationship you both truly want experience. Mary Jo is a life coach and wellness expert and she states " our intimate relationship is the place where there is profound opportunities to personally transform from past hurts, unhealthy outdated life patterns, beliefs and attitude to evolving and growing together in new fulfilling ways or to simply grow apart. It is through our intimate relationship that it can be revealed to us our deepest past wounds and greatest triggers due to unresolved emotions as well as our greatest levels of deep meaningful connections, love, friendship, honour and support. " Book a Luxury Couples Retreat with Counselling Sessions / Wellness Coaching and Wellness Schedule of Yoga / Meals / Hot Pools / Massages and more for $1195 per day for 2 pp. Accommodation is in our stand alone spectacular Alpine Villa & Spa.